A breed standard is the guideline which describes the ideal characteristics, temperament, & appearance of a breed & ensures that the breed is "fit for function" with soundness essential. Breeders & judges should at all times, be mindful of features which could be detrimental in any way to the health, welfare or soundness of this breed. NB ~ In Australia, the ESS is judged by the Australian National Kennel Council (ANKC) Breed Standard, as issued by the Kennel Club (KC), UK ~ & it can be viewed BELOW. However, I have also included versions issued by the American Kennel Club (AKC), Canadian Kennel Club (CKC) & the Fédération Cynologique Internationale (FCI) at the bottom of this page purely out of interest & it is well worth scrolling down to read them. As can be seen reading the 'Tail' definitions, Tail Docking, although banned in Australia, is still allowed in the United States, Canada & other countries around the world. Symmetrically built, compact, strong, merry, active. 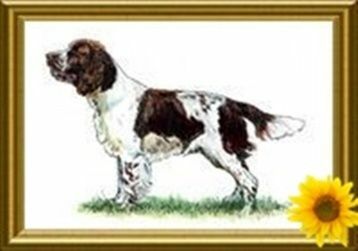 Highest on leg & raciest in build of all British land Spaniels. Skull of medium length, fairly broad, slightly rounded, rising from foreface, making a brow or stop, divided by fluting between eyes, dying away along forehead towards occipital bone which should not be prominent. Cheeks flat. Foreface of proportionate length to skull, fairly broad and deep, well chiselled below eyes, fairly deep & square in flew. Nostrils well developed. Lobular, good length & width, fairly close to head, set in line with eye. Nicely feathered. Jaws strong, with a perfect, regular & complete scissor bite, i.e. Upper teeth closely overlapping lower teeth & set square to the jaws. Good length, strong & muscular, free from throatiness, slightly arched, tapering towards head. Forelegs straight & well boned. Shoulders sloping & well laid. Elbows set well to body. Strong flexible pasterns. Strong, neither too long nor too short. Chest deep, well developed. Well sprung ribs. Loin muscular, strong with slight arch & well coupled. Hindlegs well let down. Stifles & hocks moderately bent. Thighs broad, muscular, well developed. Coarse hocks undesirable. Strictly his own. Forelegs swing straight forward from shoulder, throwing feet well forward in an easy free manner. Hocks driving well under body, following in line with forelegs. At slow movement may have a pacing stride typical of this breed. Close, straight & weather resisting, never coarse. Moderate feathering on ears, forelegs, body & hindquarters. Liver & white, black & white, or either of these colours with tan markings. Height: approx. 51 cms (20 ins). Any departure from the foregoing points should be considered a fault & the seriousness with which the fault should be regarded should be in exact proportion to its degree & its effect upon the health & welfare of the dog, & on the dog’s ability to perform its traditional work. Male animals should have two (2) apparently normal testicles fully descended into the scrotum. Section 2 ~ Flushing Dogs. BRIEF HISTORICAL SUMMARY: Breed is of ancient & pure origins, oldest of sporting gundogs; original purpose was finding & springing game for net, falcon or greyhound. Now used to find, flush & retrieve game for gun. GENERAL APPEARANCE: Symmetrically built, compact, strong, merry, active. Highest on leg & raciest in build of all British land Spaniels. Lips: Fairly deep & square. Jaws/Teeth: Jaws strong, with a perfect, regular and complete scissor bite, i.e. upper teeth closely overlapping lower teeth & set square to the jaws. Ears: Lobular, good length & width, fairly close to head, set in line with eye. Nicely feathered. Strong, neither too long nor too short. Muscular, strong with slight arch & well coupled. Deep, well developed. Well sprung ribs. FOREQUARTERS: Forelegs straight & well boned. Shoulder: Sloping & well laid. Elbow: Set well to body. Forefeet: Tight, compact, well rounded, with strong, full pads. Thigh: Broad, muscular, well developed. Hock: Moderately bent. Coarse hocks undesirable. Hind feet: Tight, compact, well rounded, with strong, full pads. HAIR: Close, straight & weather resisting, never coarse. Moderate feathering on ears, forelegs, body & hindquarters. COLOUR: Liver & white, black & white, or either of these colours with tan markings. SIZE & WEIGHT: Approximate height at withers: 51 cm (20 ins). N.B. : Male animals should have two (2) apparently normal testicles fully descended into the scrotum.